This package contains images and iconography for press, media, and publishers. They’re free to use when referencing the Omni Group software and company. If you’re looking for a particular screenshot to use as well, just ask — we might have something for you. For reviews, feel free to take your own screenshots that represent the application correctly. We also reserve the right to withdraw permission, if needed. Specific application names of the Omni Group are trademarked. You’re welcome to use each name (ex: OmniPlan) in your publication, article, book, or review. Please don’t misrepresent the purpose or idea of the application. The Omni Group logo is a registered trademark and one of our most valuable assets. Please adopt these guidelines when using the logo on websites, blogs, videos, screencasts, and advertising. 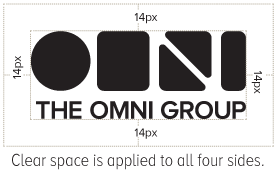 The Omni Group logo shown in these guidelines is for promotional use only. The Omni Group reserves the right to withdraw permission to use the logo anytime it is inconsistent with these guidelines or is otherwise deemed inappropriate by Omni. The Omni Group logo has unique shapes, letterforms, and typography. Only the logo shown here is approved by the Omni Group. Do not replace, alter, or move the Omni Group logo shapes or typography. The minimum size of the logo is 44px high. Use the logo at a larger size whenever possible. The minimum clear space is 14px. Please don’t place photos, typography, or other graphic elements inside the minimum clear space. The Omni Group logo is provided as an Encapsulated PostScript (.eps) and Portable Document Format (.pdf) file in black, white, and blue. It can be placed on a black or white background, or on a solid color background, as long as legibility is not diminished. Do not place the logo on a visually cluttered, patterned background, or a background that is similar in color to the logo you are using.